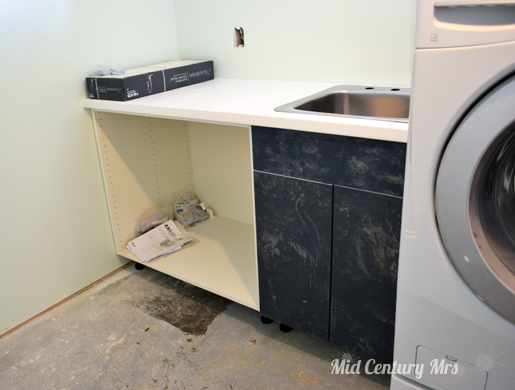 The purpose of actually finishing the laundry room was to make more practical storage for our home. Well, then there is the fact that I am the one that does the laundry and I really just wanted a nice, clean space that I could sort of enjoy while doing the laundry. Our main storage issues on the main floor of our home are in the kitchen and our bedroom closet. We have exactly 4 cabinets in our kitchen, one that we've added and does not match the others at all. So, we have no real home for things like crock pots and mixers, things that I could probably live without but want and use a fair amount, just not every day. I mostly wanted one big cabinet that I could keep all the things we don't use almost daily. On the bedroom closet front, our bedroom closet is tiny. We have two bars for hanging, one high and one low. Bill and I both get one and they're both backed full. So, the laundry room tends to be our overflow and the spot that houses the long things that don't fit in our closet because of the double bar situation. I really wanted a big sort of built in wardrobe or cabinet that I could hang up those few dresses I have, Bill's suits, and even our off season coats. Let's just say, we came up with about 20 different layouts for cabinets and/or wardrobes in the laundry room. Things kept changing in that room, so I kept changing my layout to accommodate what was happening. We decided that Ikea was the way to go in this department. There were lots of options available for us to make things work for us. We could also save money by putting together and installing ourselves. 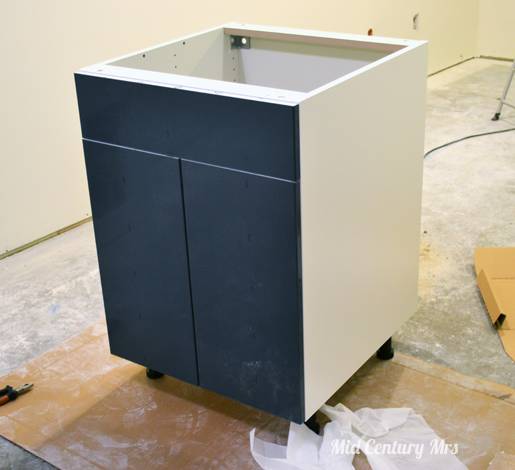 I originally wanted lower cabinets that would accommodate the utility sink and then a big Pax wardrobe for hanging stuff, thinking that shoes could reside in the bottom as well. To make this already long story that is in reality much, much longer, I'm going to cut to it. Everything was thrown out the window and are down to just focusing on the one wall with the sink for now. 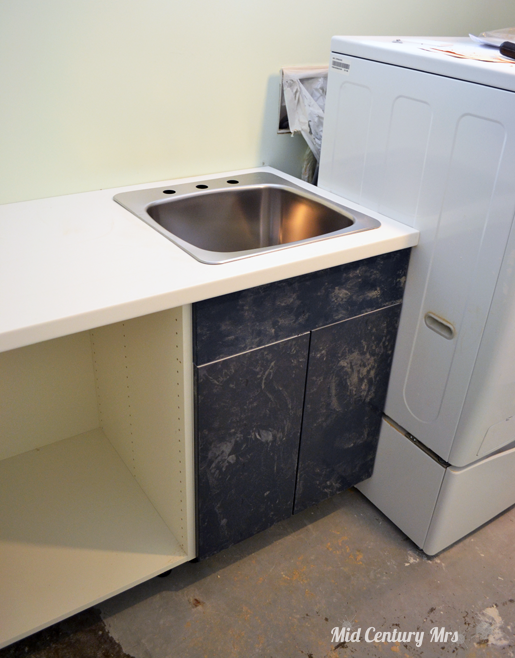 We had exactly 6 feet to work with, so we were able to get the 24" wide sink cabinet and the 36" regular cabinet with the high gloss gray Abstrakt doors. Ikea ended up being really easy, but a pain at the same time. We went on a Saturday and it was crazy busy. 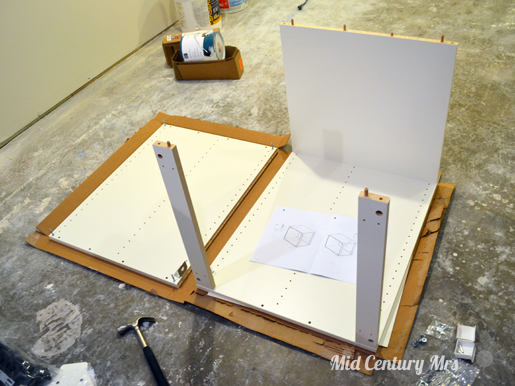 The doors for the 36" wide cabinet were out of stock, set to arrive on Monday or Tuesday. We ordered everything else we needed, paid, and went to go pick it up from that area of the store. When we got down there they told us that the counter we had purchased was not available, as in sort of out of stock. They didn't have any in that area, but there were more upstairs, but they couldn't be taken out of that area until that evening when there were no customers in the store. So, we essentially returned the counter top knowing we had to come back for the doors anyway. 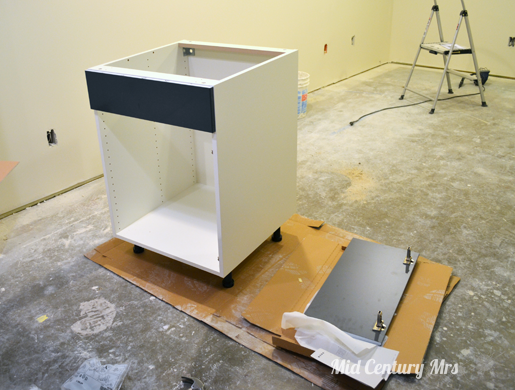 That night we put together the cabinets. It was actually really easy, probably more so than some of the other Ikea items we've put together in the past. We did have an issue with the door hinges at first because the directions weren't super clear, but a quick YouTube video search had us all sorted out in about 60 seconds. We decided to go ahead and hit Ikea when they opened the next morning to grab the counter and miss the crowd. While there was less crowd overall, the kitchen ordering crowd was heavier than the day before. We had to wait awhile to "order" the counter again. We also went ahead and did the toe kick board for below the cabinets (had sort of forgotten about that the day before). We wanted to make sure we weren't holding anything up and we were hoping that the plumber would be out to put in the sink and finish up in the laundry room on that Monday or Tuesday. Well, we had everything that was absolutely needed ready to go, but let's just say the plumber didn't show up for almost a week. On Monday morning our contractor actually attached the cabinets to the wall and each others, made sure they were level, and cut & installed the counter top for us. He even had the toe kick board cut to size and snapped on for us. On Bill's lunch break that day, we quickly ran over to Ikea and grabbed those doors that had come in. Poor dude went to Ikea 3 days in a row... It is always insane there, so it's always a slightly stressful trip, even if you're just going to browse.